Although not identified as such, the photograph appears to be voter registration demonstrations associated with the Freedom Day event held in Hattiesburg, Mississippi, on January 22, 1964. As a reporter for the Hattiesburg American, Moncrief covered the demonstrations that began on a wet and cold Wednesday, January 22, the day after he'd been in Jackson reporting on Governor Paul B. Johnson's inauguration. Organized by the Council of Federated Organizations (COFO), Freedom Day was a continuation of the Student Nonviolent Coordinating Committee's (SNCC) voter registration activities initiated in 1962. More specifically, the event was a test of whether Forrest County Circuit Clerk Theron Lynd was in compliance with a January 6, 1964, U.S. Supreme Court ruling that barred discriminatory tactics to prevent blacks from registering to vote. This ruling was the latest stage in a 1961 Justice Department suit against Lynd. Justice Department testimony in a March 1962 injunction hearing stated that not only had Lynd not registered a single black citizen since taking office in February 1959 but prior to January 1961 none had even been allowed to apply. During this period no records could be found to indicate the exclusion of a single white voter. The protest was coordinated by SNCC's Bob Moses with Dave Dennis of the Congress of Racial Equality (CORE) and Hattiesburg SNCC workers Lawrence Guyot, Sandy Leigh, John O'Neal and Victoria Gray Adams. In addition, COFO brought in civil rights leaders to assist, including Fannie Lou Hamer, Amzie Moore, Aaron Henry, Annelle Ponder, Ella Baker, Jim Forman, and John Lewis, as well as a delegation of white clergy representing the National Council of Churches (NCC). Freedom Day was preceded by a rally on January 21 at St. Paul's Methodist Church attended by Aaron Henry and Charles Evers. During his speech Henry recalled the blaring fire department sirens, which had attempted to disrupt the Freedom Vote Rally on October 29, 1963. The first Freedom Day held in the state, the event drew national media attention. Local officials and law enforcement coordinated their activities with the Mississippi Highway Patrol, with the goal of peaceful containment. Anticipating a heavy media presence, their primary objective was to give the press nothing violent or provocative to report. Hattiesburg American articles and communication between local and state officials indicate that they were very pleased with their handling of events and the resulting appearance of "tranquility." Describing a third day of "quiet demonstrations," the American proudly quoted a Chicago newsman as saying "The only thing shocking about the stories I've filed this far is the complete absence of anything shocking." Also documenting Freedom Day was historian Howard Zinn, who detailed his participation in his 1964 book, SNCC: The New Abolitionists. 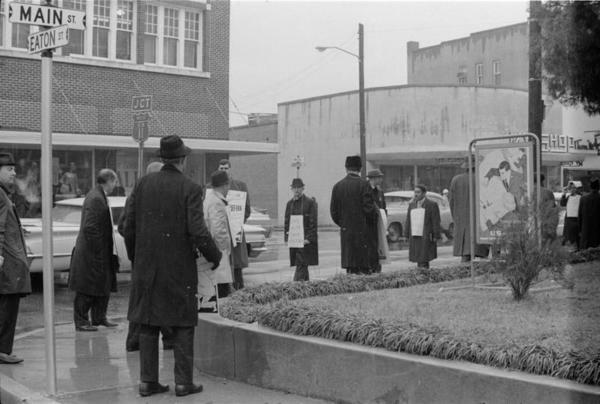 Zinn is pictured in Moncrief's photographs standing outside the Sears and Roebuck store opposite the courthouse in a group of organizers and participants, which included John Lewis, Bob Moses, and James Forman (items 52, 67, 68, 69, 76). Zinn describes how a police squad marched down the street around 9:30 a.m. and cleared all traffic (items 31, 32, 33). A police car with a loudspeaker also pulled up, and the picketers were ordered repeatedly to disperse. Although the police cleared those sheltering from the rain in front of Sears, the picket line continued outside the courthouse. The organizers had anticipated mass arrests, but none came. Zinn recalled, "[i]f our senses did not deceive us, something unprecedented was taking place in the state of Mississippi: a black and white line of demonstrators was picketing a public building, allowed to do so by the police." Records pertaining to civil rights activities in Forrest County, Freedom Day, and Theron Lynd are available online in the Mississippi Sate Sovereignty Commission records. The following folders are specifically identified as containing information on Forrest County. Click on the link below to access the folder. Additional records may also be found by conducting a broader Name Search for individuals identified in these images. Please be aware of variant name spellings when conducting searches. Listed below are pages for documents in the Forrest County Folder [2-64-1], which specifically focus on the demonstrations that began with Freedom Day on January 22nd, 1964. Additional references may occur elsewhere in the Forrest County and Publicity folders. Published reports of activities which began on January 22nd, 1964 are located in the following pages. Additional published reports may occur elsewhere in the Sovereignty Commission records. The name of the individual Theron Lynd was indexed on the following pages of Sovereignty Commission records. 2 John Dittmer, Local People: The Struggle for Civil Rights in America (Urbana and Chicago: University of Illinois Press, 1994), 219-221; Hattiesburg American, January 20-22, 1964; 301 F.2d 8181, U.S. v. Lynd, (C.A.5 (Miss.) 1962); Herbert Randall and Bobs Tusa, Faces of Freedom Summer (Tuscaloosa, Alabama: University of Alabama Press, 2001), 10-11; Howard Zinn, SNCC and the New Abolitionists (Beacon Press: Boston, 1964), 102-122; Danny Lyon, Memories of the Southern Civil Rights Movement (University of North Carolina Press: Chapel Hill & London, 1992), 130-133; Eric Burner, And Gently He Shall Lead Them: Robert Moses and Civil Rights in Mississippi (New York University Press: New York & London, 1994), 142-143; Hattiesburg American, January 20-31, 1964; Memos from R. L. Morgan, Chief of Patrol, Mississippi Dept. of Public Safety to Col. T. B. Birdsong, Commissioner of Public Safety and Governor Paul B. Johnson Jr., January 22-24, folder #2, Highway Patrol Papers in the Paul B. Johnson Family Papers, Box 144, McCain Library and Archives, University of Southern Mississippi, Hattiesburg; Tom Scarbrough and Virgil Downing, Supplemental Report-Forrest County-Hattiesburg, Voter Registration Demonstrations, January 31, 1964, Sovereignty Commission Online SCRID# 2-64-1-63-1-1-1 to 5-1-1 <http://www.mdah.state.ms.us/arlib/contents/er/sovcom> (August 9, 2005).